Helen Donath, Arleen Auger, Helen Watts, Marga Hofgen, Adalbert Kraus, various soloists. 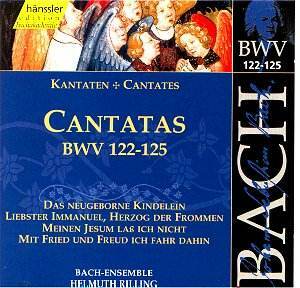 Bach Ensemble Helmuth Rilling. Hanssler Classics Vols 39 & 40, 75m 73m ADD. 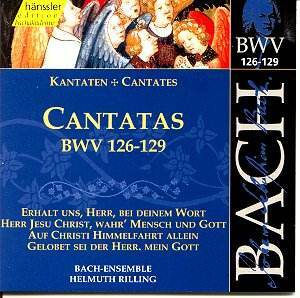 These two central volumes from the burgeoning Hanssler Bach Edition present us with eight short cantatas that are more or less consistently inventive in their style. From Volume 29, I would select the mystic No. 125 entitled 'In Peace and Joy Do I Depart which has some wonderful solos as well as a very deeply spiritual chorale that reminded me of the closing chorus in the St Matthew Passion. The same goes for the ethereal ''The Newly Born, The Tiny Child' (No. 122) where one may admire the simplicity and simple piety of this great composer in his settings of many woodwind instruments to provide a child-like setting that is very effective. The more overtly pompous 'Dearest Emanuel, Lord of the Faithful' is quite different with the celebratory nature of the music depicting a firm Lutheran faith whilst the minute 'This My Jesus I'll Not leave' is the shortest of all the works on offer but is also a very beautiful piece with a pleasant aria for the tenor. The second volume under review here contains works of a decidedly more pompous nature. 'On Christ's Ascension to Heaven', No. 128 is remarkable for its enthusiastic drive and rhythm and the deep spiritual faith in this event is succinctly portrayed in the heavy scoring that permeates the piece. Both 'Maintain Us Lord, Within Thy Word' (BWV126) and Give Honor to the Lord my God' (BWV129) open with trumpet fanfares and there are also parts for timpani thus continuously providing a celebratory statement to the spiritual text. The latter cantata is particularly inspired and I also detect some parts which, resurrect themselves in the B Minor Mass, most noticeable in the Credo of that latter masterpiece. Sandwiched between such pomp and circumstance is 'Lord Jesus Christ, True Man and God' a reflective work that includes one of Bach's favourite instruments, the 'flauto dolce' which makes a prominent appearance in all parts. Performances are in the grand tradition but Helmuth Rilling and his select group of soloists bring a wonderfully persuasive air to the proceedings that make these performances remarkably modern and authorative. Although some of the recordings go back to the early 1970's, Hansler have refurbished the sound very well indeed and this series competes extremely well with other ongoing recordings by Koopman (Erato), Suzuki (BIS) or Eliot Gardiner's (DG) 'selected' Cantata pilgrimage'.